Firstly, before we throw ourselves wholeheartedly into the story behind this particular shot, I feel it very important to inform you all that I am no photographer. I couldn’t tell you the first thing about what type of lens one should use for a certain shot, or what level of exposure would best evoke the atmosphere and mood of an early August morning. Hell, hand me a camera that actually requires manual manipulation of focus and depth and I would be as lost and helpless as a child in Ikea. But I do like to think that I have at least some eye for detail, and my overwhelming appreciation of all things different, beautiful and ‘other’ in this world has led to me taking quite a few pictures in my life that I am immensely proud of. With this in mind you would be forgiven for thinking that I picked this picture purely for its aesthetic qualities. The silhouette of the mystical Angkor Wat against an ethereal sky, the still water dappled by the weak rays of morning sunlight – what could be more serene, more unspoiled, more picture-perfect? Although I like to think that it is a pretty marvellous picture (well done iPhone, you didn’t let me down), it is actually the back story of this particular moment that led to my selection of this photograph. Contrary to the tranquil image conveyed of a still Cambodian morning, I was surrounded by a wall of tourists. Hundreds upon hundreds of them, all jostling for the perfect shot of this once in a lifetime moment. The struggle to get to the front was akin to a fight to the death, and my pictures were the spoils of my victory. When describing this moment to my parents on my return home, ‘still’ and ‘quiet’ were the last words that came to mind. Without meaning to crush anyone’s dreams, the moment that I imagined was at complete odds with reality. So much for a silent appreciation of Cambodian history! I was also probably not in the sort of state you would expect when I took this picture – expel any images from your mind of Lara Croft or David Attenborough. It almost pains me to admit it, but I was still kind of drunk when I took this photo. 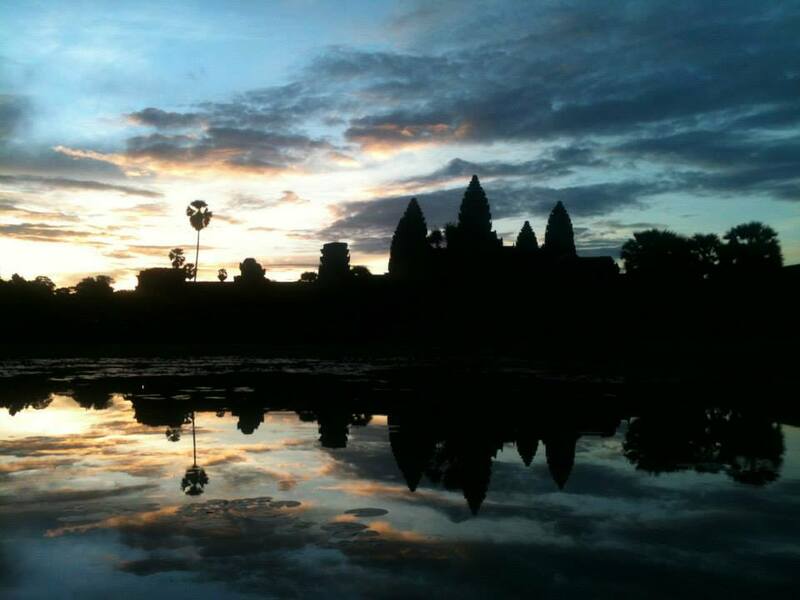 My flatmates and I took full advantage of the Siem Reap nightlife, and as a result we rocked up for sunrise at 6 in the morning with only two hours sleep, still pretty hammered and delirious with the excitement of our Asian adventure. It’s safe to say I was the most sober out of the three of us – just to my left the first flatmate was drunkenly swaying into a poor Chinese woman’s prize shot of the temple, and the other flatmate excused herself to go sit by a tree in a feeble attempt to rid herself of the hangover to end all hangovers. The only epiphany any of us experienced that day was that it is pretty foolish to drink before a moment like this, and if drinking is a necessity then it is better to just avoid sleep altogether and power through. This little anecdote, which still reduces me to childish laughter, is far more significant and special to me than any picture of a temple at sunrise. I know what you’re thinking, dear readers. You’re thinking I’ve just undermined the whole point of this exercise, that I’ve reduced the meaning of the picture to some sideshow act. It begs many a question – ‘What kind of bizarre, convoluted message are we supposed to take from this? And if the story behind the image is so important, why didn’t you just stick in a ruddy great picture of your flatmates swaying about or collapsing next to a tree? !’ Well, here’s my attempt at being profound. The proverb “a picture can paint a thousand words” is undoubtedly true, but I feel this picture also shows how we can never truly understand the context of a captured moment. No one will hear the noise of a hundred clicking cameras shattering the silence, or feel the exact feelings that I and my peers felt, whether under the influence of alcohol or not. Images are imbued with meaning, and although the true meaning of this moment may be lost on others, to me it is irrevocably linked with my own mental image of that experience. On a more basic and shallow level, perhaps the real message I am trying to convey is that even when you’re still half rat-arsed on cheap vodka and red bull, you can still take a beautiful picture. I leave the interpretation up to you. Melanie Christie is a second year student at Edinburgh University. She studies English Literature and History. She likes to think that her cultural interests make her slightly more interesting. She also spends a great deal of her time basking in her fox onesie, has a profound weakness for chocolate, and is a proud Hufflepuff – that’s loyalty for you, folks! I read this article and found it very interesting, thought it might be something for you. The article is called A Sunrise To Remember – #photographicmemory and is located at http://prancingthroughlife.com/2013/12/02/a-sunrise-to-remember-photographicmemory/.